The great Latin American revolutionary writer, Eduardo Galeano, once said toVltchek, “It is time to raise old flags. It is time to un-dust them and once again gather under them.” The Revolution is not over. Communism and socialism are far from being defeated. One of the leading left-wing thinkers today, Andre Vltchek, in this collection of philosophical, revolutionary essays, explains why revolutionary optimism is so feared in the nihilistic West and, by taking us to all corners of the world, proves that people everywhere are still capable of dreaming, hoping and fighting for a much better world and for eternal ideals! ﻿Powerful, Urgent, this book is straightforwardly challenging Western Anti-Communist and Anti-Internationalist Dogmas. "The Great October Socialist Revolution" began by a proud salvo from Aurora. It broke the prison wall as well as chains, and a secret road suddenly opened. The journey began. Several countries rode, following the revolutionary ideals. Since then, some have fallen. Others rose again. FIGHTING AGAINST WESTERN IMPERIALISM compiles ten modified essays that were written during just a few months of the onslaught of the Western imperialism all over the world. Andre Vltchek had traveled the world searching for parallels, similarities; comparing scenarios. He tried to grasp, and then to explain, how the Empire really works, how it selects its targets, which countries it decides to destroy and why? He studied the ‘opposition movements’ manufactured by Washington and London, and how they get implanted in so many different parts of the world; basically wherever people and their governments still dare to insist on defending their own national interests and choosing their own political as well as economic systems. Western Terror is a book of essays and political commentaries by Andre Vltchek that revisits many complex regional conflicts on our planet, including in the United States, Iraq, India, East Timor, Indonesia, and Latin America. Plays: "Ghosts of Valparaiso" and "Conversations with James" are two great plays by Andre Vltchek in one book, published by Badak Merah. "Ghosts of Valparaiso" is a revolutionary drama, a love story between Chilean journalist and Southeast Asian ghost. Both Chile and Indonesia had been suffering from terrible destruction by Western regime. A comedy "Conversation with James", is an atheist play about much higher civilization that decided to create human beings. It is them, not God, controlling our lives. In these remarkable interviews with André Vltchek and Rossie Indira, edited by Nagesh Rao, Indonesia’s most celebrated writer speaks out against tyranny and injustice in a young and troubled nation. Toer here discusses personal and political topics he could never before address in public. Toer is best known for his novels comprising the Buru Quartet. The New York Times described his autobiography as a “haunting record of a great writer’s attempt to keep his imagination and his humanity alive under terrible conditions.” Toer is widely considered a strong candidate for the Nobel prize in Literature. Liberation Lit is a landmark collection of art and criticism of social change: contemporary liberatory fiction and criticism, poetry and visuals. In On Western Terrorism Noam Chomsky, world renowned dissident intellectual, discusses Western power and propaganda with filmmaker and investigative journalist Andre Vltchek. The discussion weaves together a historical narrative with the two men's personal experiences which led them to a life of activism. A blast of fresh air which blows away the cobwebs of propaganda and deception, On Western Terrorism is a powerful critique of the West's role in the world which will inspire all those who read it to think independently and critically. 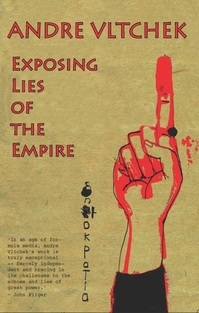 EXPOSING LIES OF THE EMPIRE is perhaps the most complete, and the most comprehensive account of the last several years, during which our planet has risen up and began its struggle against the Empire and its oppression. Oceania: neocolonialism, nukes and bones is a critical appraisal of the destructive consequences of colonialism and later neocolonialism and how they have reshaped and undermined the very essence of Pacific humanity. It provides a rather uncomfortable but justifiably powerful moral message that the perils of Oceania need drawing attention to for the future survival of Pacific peoples and cultures who, isolated from the main centres of global power, are often relegated to the margins of development and progress. André Vltchek spent five years living and traveling throughout Oceania. During his journey he interviewed politicians, social-workers, journalists, teachers, doctors and the local inhabitants. He became friends with the great Pacific writer Epeli Hau’ofa who declared him an ‘honorary citizen of Oceania,’ and he intricately documented the appalling effects Western government policies, corporate strategies and military operations were having on the islands and the peoples of the Pacific. POINT OF NO RETURN shows the world through the eyes of a war correspondent, working in conflict zones avoided by the mainstream media, unveiling the dire state of today’s world, its disparities and brutal post-colonial arrangement – including the imperialist push for Western hegemony. THE WORLD ORDER AND REVOLUTION! THE WORLD ORDER and REVOLUTION! - Essays from the Resistance is a compilation of essays (thoughts, analyses, and dreams) by three outstanding authors: an international lawyer, an economist, and a philosopher. They are fighting against neoliberalism and imperialism. Each engages in the struggle in his own way, maybe using different ‘weapons’, but the goals are the same: economic and social justice for those who do all the work in society, respect for the true freedom of the individual to experience and express their humanity, respect for the rights of others and dedication to learning of and writing about the true situation of the peoples of the world as they exist today and the future possible now and tomorrow. The three authors are joining forces in order to fight for a better world. This book is for the people everywhere who are oppressed, as a sign of solidarity and a handshake. This book is also a warning to the oppressors, to whom they say: ‘j’accuse!’ All the three authors have seen the world as it is, and they have witnessed wrong in all its forms! As an international lawyer, Christopher Black has had to confront the injustice of the laws and institutions of this criminal system. As an economist, Peter Koenig fights neoliberalism, which is, in summary, nothing else than economic fascism. As an observer and chronicler of history and world events, Andre Vltchek has witnessed some of the most atrocious moments in modern history, documented them, and exposed those responsible for the crimes against the people. All three authors stood up to resist the destructive forces of imperialism and neoliberalism. All three authors refused to remain silent. All three authors became fighters. All three authors are hoping to spread seeds that may help awakening human consciousness. We hope that you will join them! "Andre Vltchek has compiled a stunning record in evoking the reality of the contemporary world, not as perceived through the distorting prisms of power and privilege, but as lived by the myriad victims. He has also not failed to trace the painful – and particularly for the West, shameful – realities to their historical roots. The remarkable scope of his inquiries is illustrated even by the titles of some of his major books: Western Terror: From Potosi to Baghdad, a vast range of topics that he explores with rare insight and understanding; and Exile, his interviews with Indonesia’s great novelist Pramoedya, who spent a large part of his life in internal exile, imprisoned by the murderous and vicious Suharto government in Indonesia, which was greatly admired by the West, and enthusiastically supported in its shocking crimes, after it won approval by carrying out a mass slaughter that the CIA compared to the crimes of Hitler, Stalin, and Mao, and opened up the rich resources of the country to Western exploitation. Please click here to order Hardcover edition. Please click here or here to order Paperback edition. Noam Chomsky discusses Western power and propaganda with filmmaker and investigative journalist Andre Vltchek. This book is the perfect introduction to Chomsky’s political thinking, and makes a refreshing read for anyone who is uneasy about the West’s wider role in the world. Beginning with the New York newsstand where Chomsky started his political education as a teenager, the discussion broadens out to encompass colonialism and imperial control, propaganda and the media, the Arab Spring and drone warfare. The authors offer a powerful critique of the legacy of colonialism, touching upon many countries including Syria, Nicaragua, Cuba, China, Chile and Turkey. Contains a new foreword by Noam Chomsky. Story of Ann is a short work of fiction written by Andre Vltchek, illustrated by Marina Wiedemann. It is part of Education for All Literacy Promotion Series published by UNESCO. Ann is 35 years old woman, married with two young children living in a capital city in a East African country. Confronted by the sudden death of her husband of AIDS and the need to make a living to care for her children, with much support from her friends and extended family, Ann embarks on a courageous journey to self discovery though literacy and further learning. Footprint’s South American Handbook is a legend in travel guide publishing. The one-and-only “Travelers’ Bible” has had its annual overhaul, giving a comprehensive update of everything one ever needed to know about how to discover this fascinating continent. This new edition is unparalleled in its depth of coverage—taking independent travelers from the well-trodden “Gringo Trail” to the wilds of the Andes, up the Amazon River, and onto deserted beaches. For more than a decade Andre is contributing to this brilliant intellectual travel guide. His entries came from Amazonia, Peru, Venezuela, Easter Island, Chilean and Agrentine Patagonia, as well as from Uruguay.